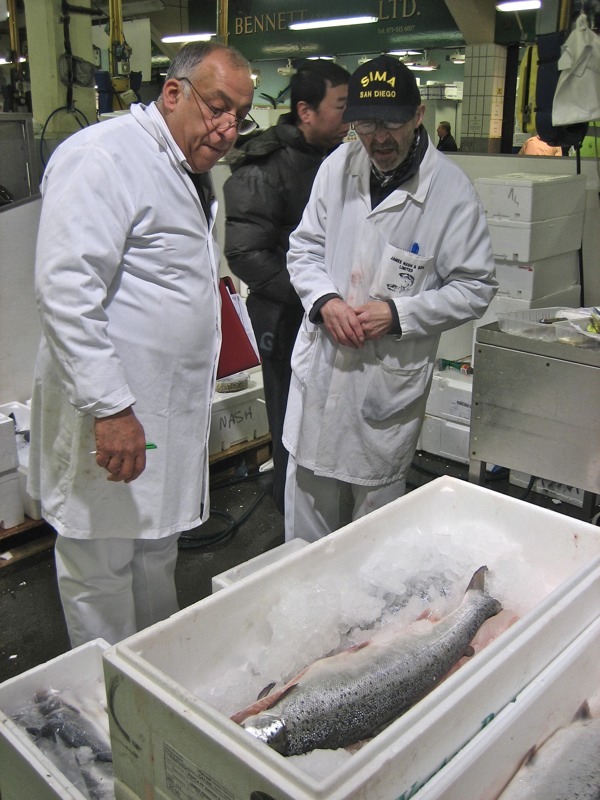 It was the coldest night of the year so far when I arrived in Billingsgate Fish Market at half past five in the morning to meet Albert Hafize, yet he bounced up to greet me warmly outside Mick’s Eel Supply, his spirits undiminished by the Siberian temperatures. 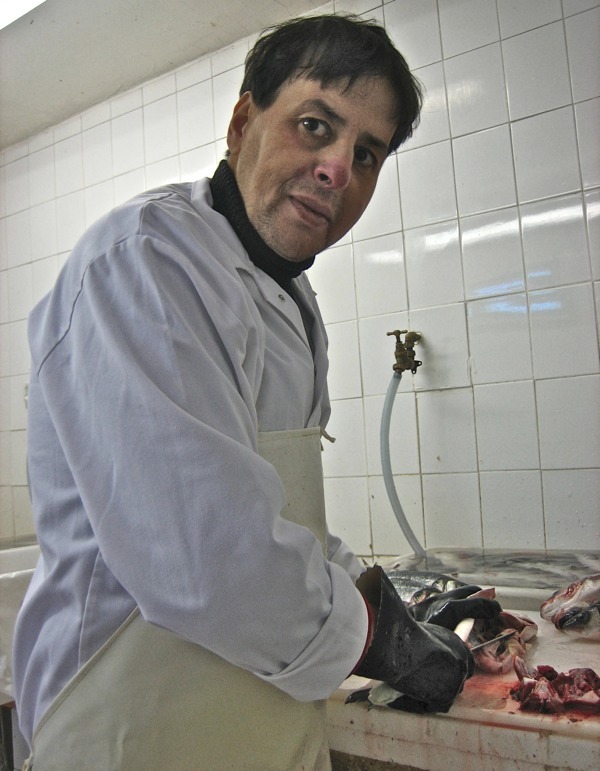 For the past thirty-five years, Albert has been coming here six nights a week, between four and seven each morning, personally selecting the highest quality fish for his business Cleopatra Seafoods, based in a modest red brick building in Whitby St, between Redchurch St and the Bethnal Green Rd, where the fish are trimmed, gutted, filleted, cured or smoked according to his customers’ requirements. 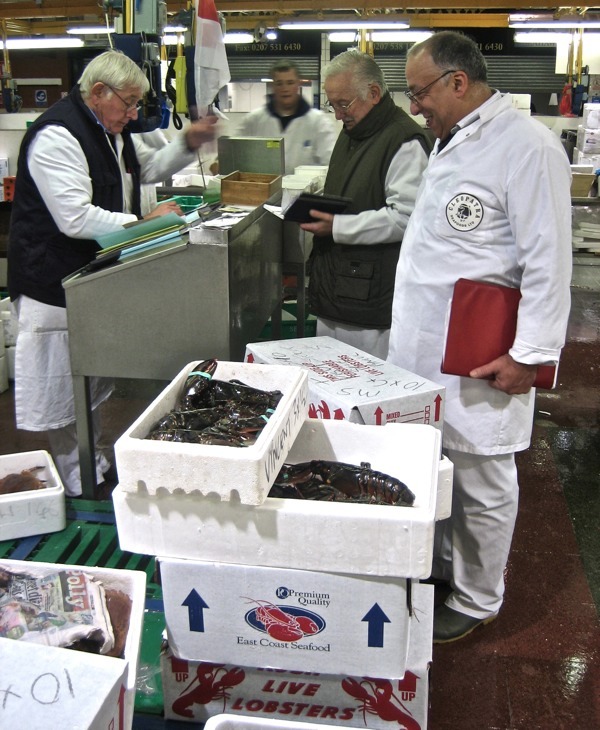 In Billingsgate, the doors were wide open and the cold night air circulated freely throughout the building, which suited everyone very well because the sub-zero temperatures provided ideal conditions for all the fish – snug in their blankets of ice and lying head-to-toe in the thousands of white boxes that filled the market – even if the traders were turning blue. No larger than the average supermarket, the central hall has the feel of an intimate marketplace where you walk among narrow aisles between stalls crammed with all the wonders of the deep, laid out before your eyes and gleaming in the halogen glare, wet and shining in all the vibrant tones of the ocean. As I gawped at the variety of Neptune’s kingdom, the large, the small, the colourful and the exotic, with scales, tentacles or claws, I quickly realised that my gaze was returned by myriad fish eyes looking back at me, and some were still alive. 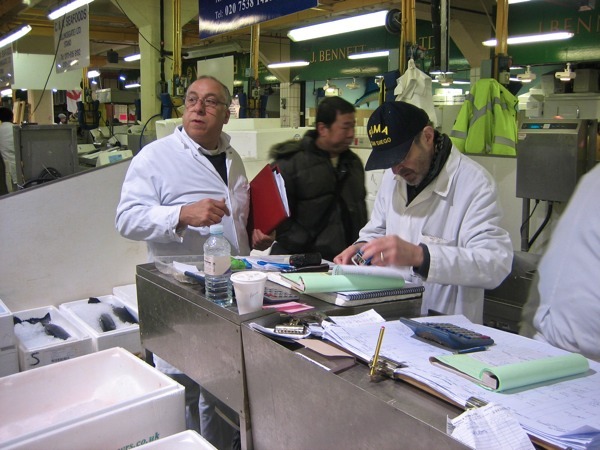 Yet this was Albert’s familiar constituency, and I had to run to keep up with him as he ducked and dived between the stalls, seeking the items upon the list on his red clipboard. 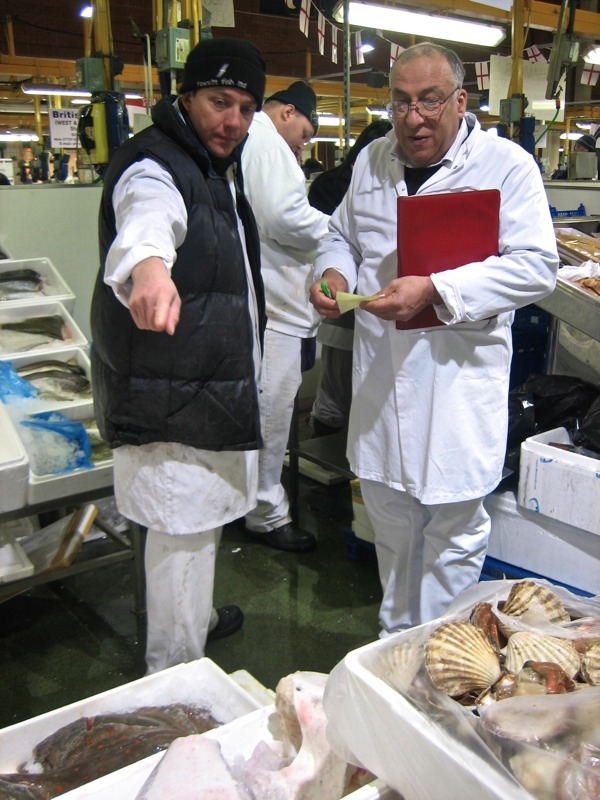 Hyper-alert, with acute focus, his eyes never stopped moving, scrutinising the options and checking the prices with the traders, negotiating and collecting the receipts as the porters swept the orders away to his van waiting in the car park. Negotiating the swarm of porters in their long white aprons coming and going with trolleys, we walked outside in the dark beneath the shadow of the Canary Wharf Tower to check the night’s haul, comprising a tall pile of boxes on the tarmac, some with fish neatly packed, others with live lobsters crawling around inside and an enigmatic box with a enormous fish tail protruding from one end. 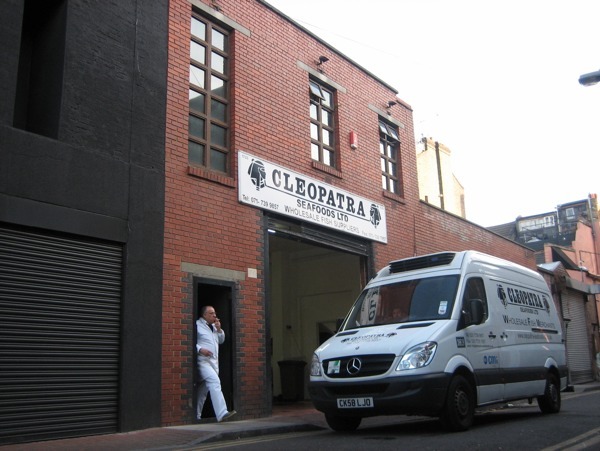 Eager to get back to Shoreditch, Albert started loading them into the van in the halflight and I lifted the boxes, passing them to him while he stacked them inside. While Albert sought the last few items on his list, he arranged for me to have cup of tea in the cafe with Sheldon Davis, fish porter and chairman of the union. “A year or so ago, we were told the badges wouldn’t be renewed,” he explained regretfully, holding up the red and white enamelled plate that is his licence to work, issued by the City of London in a system established in 1878. Many porters are third or fourth generation in the trade and I spoke to one whose grandfather started here after being discharged from the army, gassed in the trenches of World War I. The badge system allowed the porters to negotiate with the traders’ association and establish working rights which will get wiped out next year. 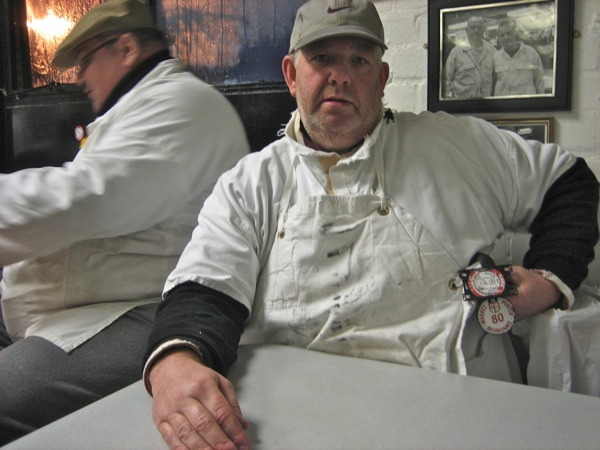 It was a touching encounter, to sit across the table in the corner of the steam-filled cafe and learn the story from this dignified man, who has been labouring here thirty years carrying fish, from three in the morning from Tuesday to Saturday and taking home no more than £450 a week. “You can only fight on and fight on, but the City of London hold all the resources,” he admitted with a grimace. As we drove back along Commercial Rd in the dawn, Albert told me that he relied upon the porters to keep an eye on his stock while the van was unsupervised in the car park and was dubious of the logic of removing the established system. 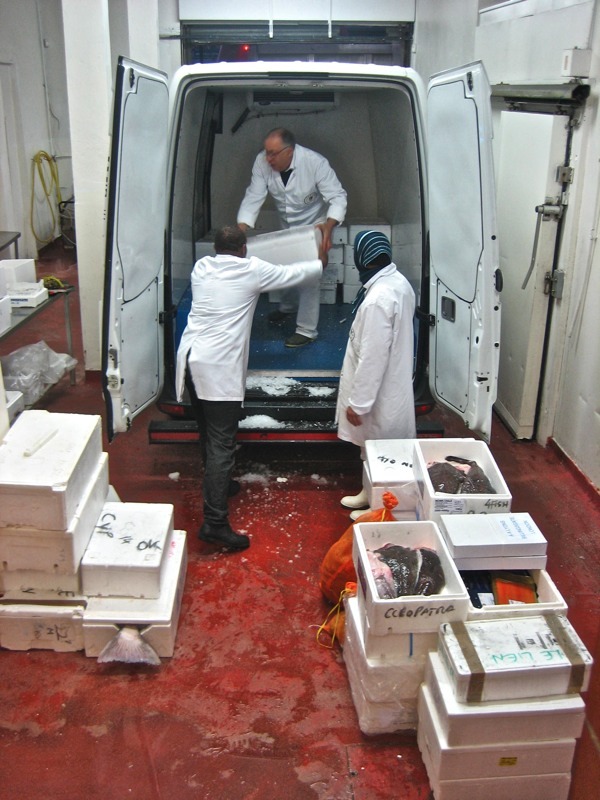 But once we arrived in Whitby St, there was no time to speak as he unloaded the fish, passing the heavy boxes from the back of van to his handful of staff who had been there all night making preparations. There was not a moment to waste as the boxes were throw open and all the orders for hotels and restaurants were put together in haste to get them out on the road and up to the West End. 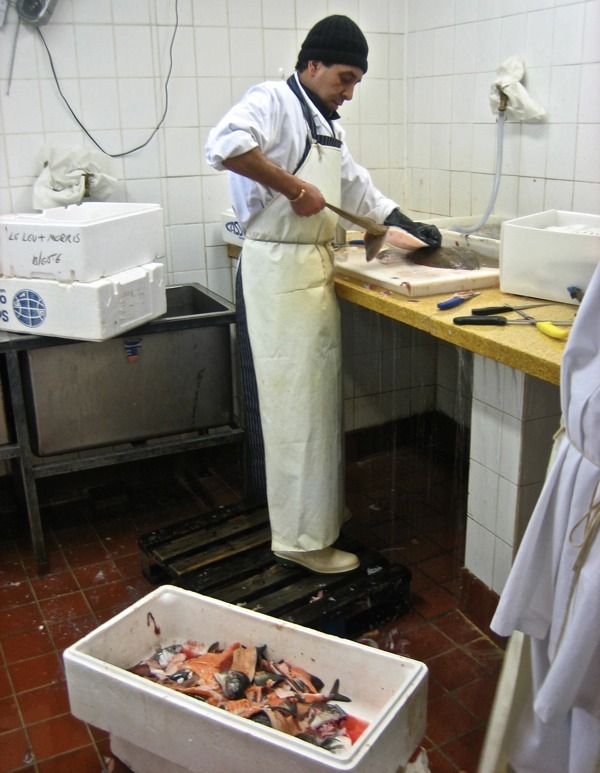 In a tiled room leading off the loading bay, with unceasing motion, Albert was unpacking boxes on a steel bench, lifting fish and scrabbling in the ice with his bare hands to apprise his stock critically and select the choice specimens to deliver to his customers. 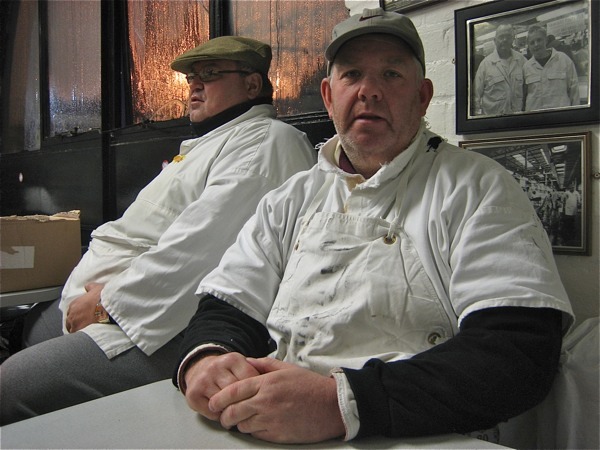 Next door in a small white room, two men stood at a stone bench where water ran continuously over the work surface, gutting, trimming and skinning fish, with the tireless persistence of machines, working through the chill of the night. Such was the momentum of this intense flurry of concentration and activity that I lost sense of time, perched in the corner with my camera and fascinated by the spectacle. 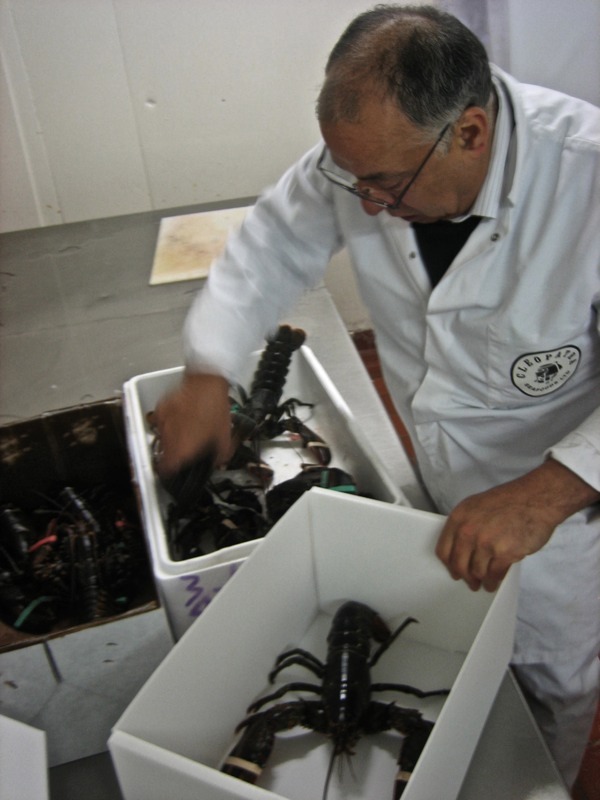 Albert’s origins are in Egypt and his brother Tony first came to London from Cairo in the employ of an international seafood company, before starting upon his own under the Wheler St arches in 1968. Twenty-five years ago, they had the current premises built when the area was all small industrial premises, but now they are the exception – a fish smokery in the midst of the frippery of bars, galleries and boutiques. 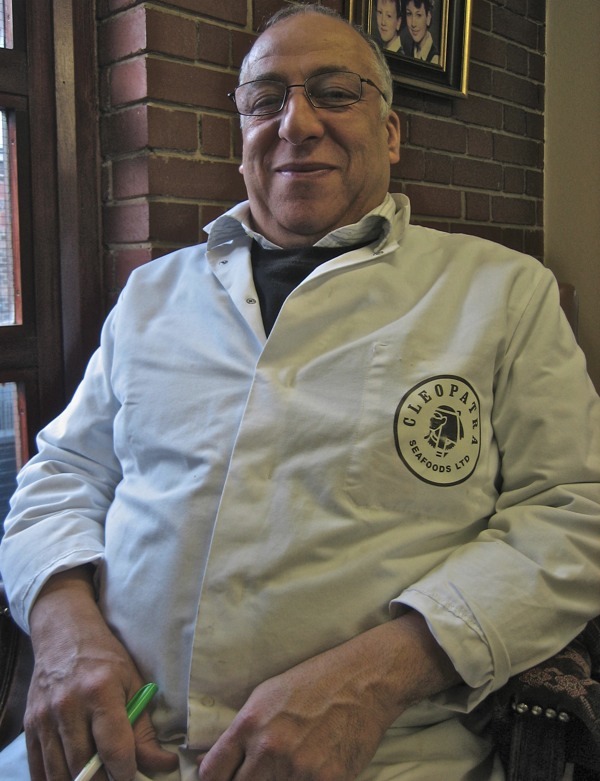 Sheldon shows his porter’s badge, which the Corporation of London is abolishing next year, ending the traditional rights of the Billingsgate porters, formalised in 1878 and dating back to the sixteenth century. Unloading in Whitby St at seven. Albert enjoys a cigarette in the morning sunshine. once again you’ve given us a vivid glimpse into another world. Great article and terrific photos. you are a national treasure ! Again, a wonderful article! Thank you so much! Could the newspapers get involved to publicize the injustice being done to the porters who have worked there all their lives? This is so wrong!